East Asia is a crowded place. The crazy-cramped architecture of locales like Hong Kong gives you an idea. But this image posted to Reddit by valeriepieris puts that population consolidation in a whole new light. And for the most part, it seems pretty accurate. Of course, it's all a bit more complicated than this visualization makes it seem, and the simplest of napkin math comes up a little short. If you take the list of the 10 most populous countries in 2008, for instance, and add up just the ones that are in that circle (China at 1.3 billion, India at 1.1 , Bangledesh at .2, Indonesia at .2, and Japan at .1) you'll get roughly 2.9 billion people out of the 2008 world total 6.6 billion. Or 44 percent. And that's leaving out all the smaller places that contribute to that whole. Another Redditor's unsourced peer-review gets a little more granular, and takes the number to just over half. Little bit of peer review.. 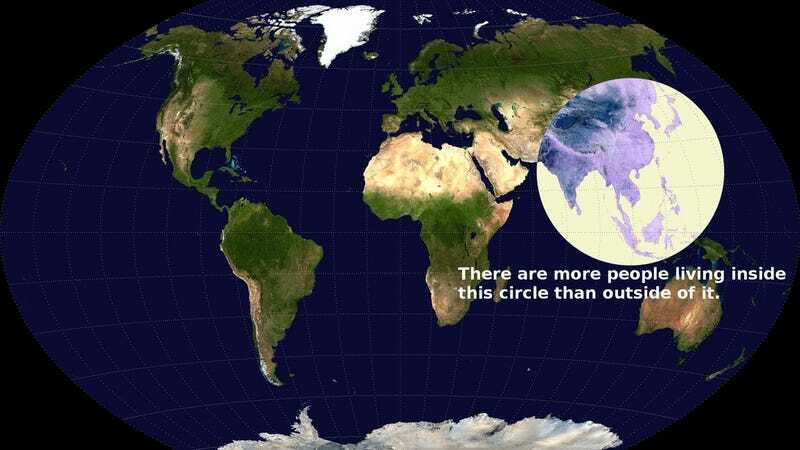 So for your post to be correct, the circle must have more than 3.5 bil people in. In any event, it's totally true that that circle (or whatever shape it would be when you smack it on a rounded surface) holds a disproportionately large portion of our planet's population. As a visualization, it's perhaps the best way you make numbingly huge population numbers hit home, by putting them in context with the world at large instead of leaving them in a vacuum. That patch of land (and water) definitely holds more than enough people to beat any combination of landmasses short of "the whole freakin' world" and that's way more incredible than just facts and figures. Even more mindblowing: said circle is mostly water.